MicroGreens are all the rage in fine dining restaurants and for good reason. 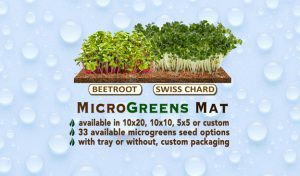 Micro greens provide a much higher concentration of nutrients and flavor than fully grown vegetables. They are easy to grow, easy to harvest and endlessly entertaining. They can be grown year round in the city or the country. With the SureGro MicroGreens Mat all you need is a windowsill and water for gourmet microgreens on demand. Given the 4-6 week cycle of MicroGreens, re-orders are built in to the concept.